Last year, the day after I was wed to Mistique we both entered the Concord Classic. That was an awesome day wearing our ‘Bride’ and ‘Groom’ t-shirts. 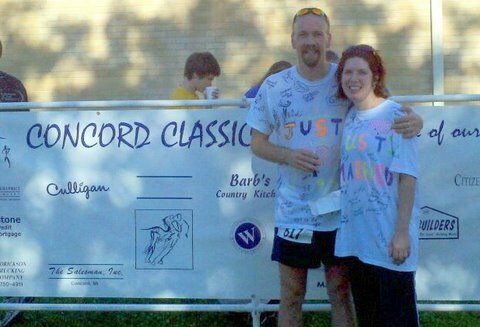 We decided then that we would try to run this race every subsequent year to celebrate our anniversary. We entered it again and decided to wear the shirts we wore last year. Friends at the race remembered that this was our anniversary race and congratulated us (again). That was nice. I am going to like this tradition. The Concord Classic is a notoriously fast course which is why so many people show up for it. This was no different. Lots of speedy high school cross country runners as well as many of my fast local running old folks. Traveling all over the country running marathons is fun, but it is also nice to run a race where you know 20+ other competitors running it. Again, I don’t do anything resembling ‘training’ for this distance. I am a ultra-marathoner doing 100+ mile weeks week in - week out, and avoid (like the plague) 400m repeats or 3 mile tempo runs. Ick. What I do have is a train load of endurance. That seems to be enough, as I can still run a sub 19 5K just walking up and running. My first mile was ~5:50 as was my second mile, which is about a minute and half faster than any run I have done since April. It felt a little weird.